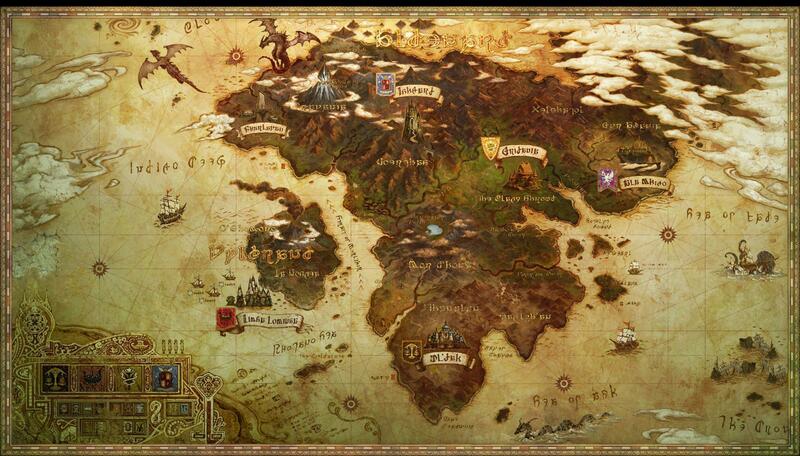 Eorzea is the main continent within the world of Hydaelyn and is where the players will begin the game. It contains the three starter cities of Limsa Lominsa, Ul'dah and Gridania. There is also Ishgard, which is the fourth major city. Smaller towns of Ala Mhigo and Sharlavan can be found on the east and west sides of the continent. Limsa Lominsa can be found on the large island of Vylbrand to the west of the mainland with its surrounding region of La Noscea. Ul'dah is the city located in the desert of Thanalan to the south of the mainland while Gridania is located in the forest region of The Black Shroud in the centre of the map. Ishgard is the city in the mountains to the west of Gridania in the region of Coerthas. Ala Mhigo can be found on the east side of the continent while Sharlavan is on the west side. The Garlean Empire is in the northeast corner of the map. We know that La Noscea is a grassy plains area, Thanalan is a desert area, The Black Shroud is a jungle, Coerthas is a mountainous region and Mor Dhona appears to be a wasteland with a large lake in the centre. Eorzea has 1 map. Click on the map for a larger version. 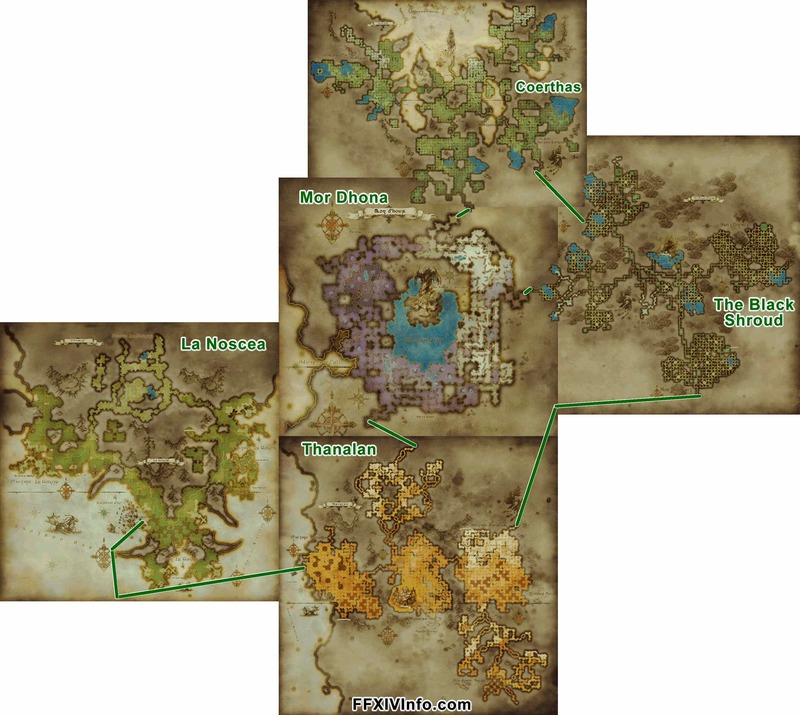 The map below shows how all of the regions in FFXIV 1.0 connected to each other. We tried to do one for ARR however the regions just don't fit together anywhere near good enough. Mainly due to Coerthas and Mor Dhona being a lot smaller. We ask that you please do not link directly to these maps as they use a lot of bandwidth. Instead link people here. The world map at the top is still the same but I will leave the old combined map up. I'm planning to update the maps tonight by adding Coerthas and Mor Dhona and replacing a few maps which I couldn't fully uncover in phase 3 due to gates. Actually, it would be great if you'd leave the old map up here even after you add the new one. I didn't play 1.0, so I found it interesting to see how it's changed. You are right, I totally forgot to update this page when I put the new maps up. I'm thinking I'll hold off doing a combined region map until we have Coerthas and Mor Dhona otherwise it will be a bit silly. The combined zone maps on the region pages are probably better for now. I will alter the page to say this is from 1.0 however. The original world map SE made is still the same however from what I can see. This is the old world, a new world map has been designed.